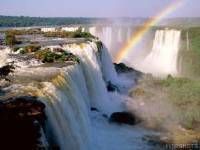 The iguassu falls are on the boarder between Brazil and Argentina. We spent the first day on the Brazillian side. The falls were just incredible. The scale was unbelievable but it was only when we got to the Argantinian side that you get to really interact and get the full impact of the falls. We began by taking a jet boat up the river, over white water and up to and UNDERNEATH, The falls. We all got absolutely soaked, but it was such a buzz. Afterwards we went to the Devils throat. This is the place where a huge congestion of water meets and crashes down, forming the largest and most violent falls. The viewing platforms allowed us to get right up close. I was totally mezmorised and had never seen anything so awesome. The noise was deafening and the spray from the falls can be seen for miles. Also went to an interactive bird park. Basically we just walked around inside the averies with the birds. It was a bit hair raising at times. Toucans were swooping over our heads!! We felt very much like Bait!! Was great to get up so close to them tho. Argentina is sooooo cheap, compared to Brazil - and i thought that was cheap! The steak here is unbelievable and the wine(and good wine) about 4 pesos - 70p a bottle!! Think im gona like it here!